Of the five LEED AP specialties available, LEED AP for Neighborhood Development (LEED AP ND) is especially well-suited for landscape architects. Becoming a LEED AP ND provides another avenue for landscape architects to advocate sustainable design at the community level. The training for landscape architecture practice is ideal for the “big picture” and multidisciplinary nature of the LEED-ND system. Compared with other LEED rating systems (developed for buildings), LEED-ND offers more opportunities for landscape architects to be involved in (and to lead) the documentation process, and the rating system also can be used as a teaching tool to help educate clients and colleagues about what makes a neighborhood more sustainable. As a LEED AP ND, you can reinforce the value that landscape architects bring to sustainable development projects, and help keep the profession at the leading edge of green building. 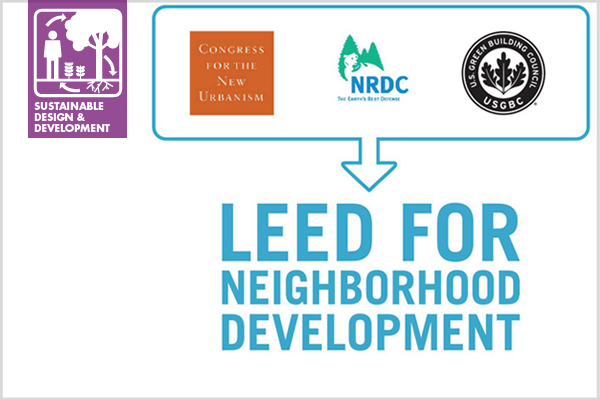 Learn more about professional accreditation for LEED-ND here and here.